This is a rather strange collection of stories and seemingly meaningless pieces, but in many ways this one work is characteristic of Julio Cortazar's body of work. Divided into four 'chapters,' Cortazar explores a whole world through his unique brand of magical realism. The first section of the book, titled 'Instruction Manual,' offers bizarre and and often unlikely instructions on a wide range of topics. The second chapter, 'Unusual Occupations,' uses numerous characters of seeming unoriginality and ends up using them in remarkable ways. The third, 'Unstable Stuff,' features more vignettes of events and people, building a vivid picture of everyday life. 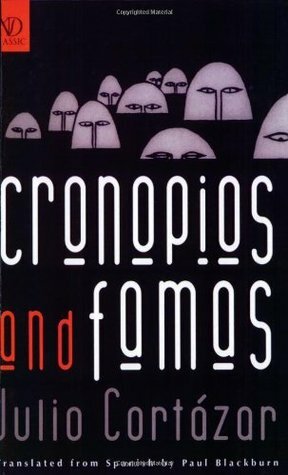 The final chapter has the same name as the book itself, dealing with Cortazar's own creations, cronopios (naive, idealistic, disorganised, sensitive beings), famas (literally, 'fames') and esperanzas ('hopes'). I'm not diving into the content of the book itself, since the defining quality of the book is Cortazar's storytelling. His style is fluid and beautiful, and draws the readers in wonderfully. Not the most substantial tales, perhaps, but for those who love stylish and poetic prose with a combination of surrealism and magical realism, this is definitely worth a read. The setting is technically Argentina, but in reality these tales could take place anywhere and everywhere. Indeed, were it not known that the book is Argentine, there's little to give any firm idea of a setting for the book!